On a recent warm summer afternoon your columnist was a guest at the lovely white stone and frame house on Old Gulph road, near Croton road, that was remodeled in 1942 by Mr. and Mrs. F.J. Whitney, Jr., from a tumbledown house originally built in three sections. The oldest section is the stone wing to the east, with the date, 1816, high up under the eaves. During the years when the old structure stood idle, slowly falling into decay, many passersby had paused to consider its possibilities. But it was not until the Whitneys saw it that anyone had the courage to undertake the remodeling that would be necessary. And it was not only courage, but vision that was required to create the lovely home as it now stands, from the derelict building which the Whitneys purchased, along with three and a half acres of ground, then only a tangle of weeds and underbrush. 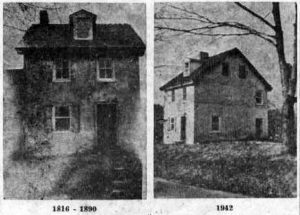 The original small stone house was built in the year 1816 by a Mr. and Mrs. Hogentogler, who had two daughters, one with the unusual name of Zuleika. Downstairs there were two small rooms, each with its own fireplace. From the back room a narrow and winding staircase led to two small bedrooms above. On the third floor, one bedroom under the slanting roof, lighted by a dormer window in the front and two small windows on the side, took up the entire space. Here the Hogentogler family lived for 70 years, after which the little stone house was sold to Frank Streeter, who built a frame addition onto the west side of it. A few years later, about 1890, he added still another section, which was divided into two parts, one for his butcher shop and the other for shelter for his delivery wagon. For more than 20 years he carried on a flourishing meat business in the small shop, the main furnishings of which were his butcher’s block and refrigerator. His slaughterhouse was a large building back of the house, near the big windmill which forced water from the nearby lake, for use in all the buildings. 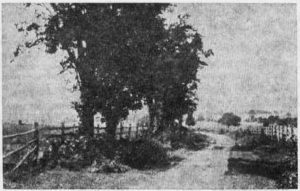 During the time that the Streeters lived there, the surrounding acreage was always under cultivation, with extensive flower and vegetable gardens. In winter, ice was cut from the lake for storage in the “ice house”, which was, in reality, not a house at all, but a large hole in the ground about 18 feet in diameter and 30 feet deep. This hole was lined with stone, forming a dry wall, and a ladder extending into its depths aided in bringing the ice to the surface for use. The ice melting from the top formed an almost solid cake at the bottom, a means of refrigeration which was good during the entire warm season, lasting until the lake froze over again. Frank Streeter, living in the house and operating the butcher shop, owned this property from 1890 until 1911, when he sold out to Evans Rogers and moved his business to King of Prussia, where he died some years ago. Evans Rogers sold all the stone lining of the underground “ice house”, and the hole thus left was completely filled in by tin cans and other refuse dumped there, until no trace was left. 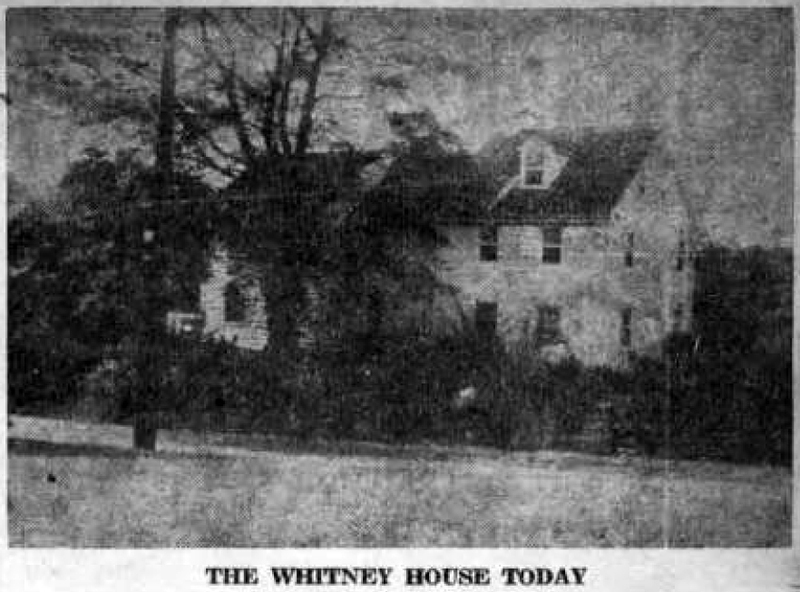 When the Whitneys bought the old house and store in 1942, they had to tear down virtually all that remained of the former store and wagon shed on the west side, retaining only the back wall. They raised the floor of this about 18 inches, bringing the level in line with the rest of the house, and built two rooms, the front one now used as a den and workshop by Mr. Whitney and the back one a bright and sunny kitchen, complete with modern equipment. In remodeling the old stone section, none of the original charm has been lost, although there have been many alterations and changes. The two small downstairs rooms have been made into one with the original doorways, shown in the early pictures, changed into windows. The main entrance is now in the center of the frame addition built by Mr. Streeter in the middle eighties. In uncovering the fireplace in the back room a long, wide, hand-hewn wood beam was discovered above it. The floors are of random width pine boards, and the windows deep set, owing to the thick stone walls. With a number of old-fashioned pieces of furniture, the large room, with its fireplaces and its windows on three sides, is indeed a charming one. Since the steep winding staircase has been removed from the back downstairs room, entrance to the second floor is by way of a more practical, although still charming, stairway in the middle section of the house. This section is now divided into the hallway and a dining room with its view onto the terrace and gardens to the rear. Upstairs the large living room is duplicated by a master bedroom of the same size and proportions, made by throwing the original two small bedrooms together. On the west end are two well-proportioned bedchambers, built over what was once the old butcher shop and wagon shed. The remodeled third floor is much longer and more airy than its predecessor ever could have been. Although the Whitneys assure guests that there is much to be done in the way of landscaping to the rear of their property, where most of their acreage lies, the present outlook is charming. On the left is the old springhouse adjoining that of their neighbor, Dr. J. Duncan Spaeth. In these two spring houses, twin streams originate and run side by side at a distance of about ten feet, until they join some 40 feet beyond. Thence they run through the Machold property and on to Colonial Village Pool and Martin’s Dam. On the right of the Whitney property to the rear is the only reminder left of the large frame barn which once stood there. This is part of the stone foundation, from beneath the crevices of which bright-hued flowers now bloom, adding their touch of beauty to the background of a house, part of which is 136 years old. To the north of Wayne lies a countryside not only steeped in beauty, but one that is sacred to all Americans because of the part that Valley Forge played in the history of their country in the winter of 1777-78. From Wayne the two main roads, that lead to the lovely Chester Valley section and to Valley Forge beyond, are Radnor road and Croton road. The former crosses old Upper Gulph road at right angles somewhat to the east of North Wayne avenue, while Croton road has its beginning slightly to the west of the place at which North Wayne avenue terminates at Upper Gulph road. 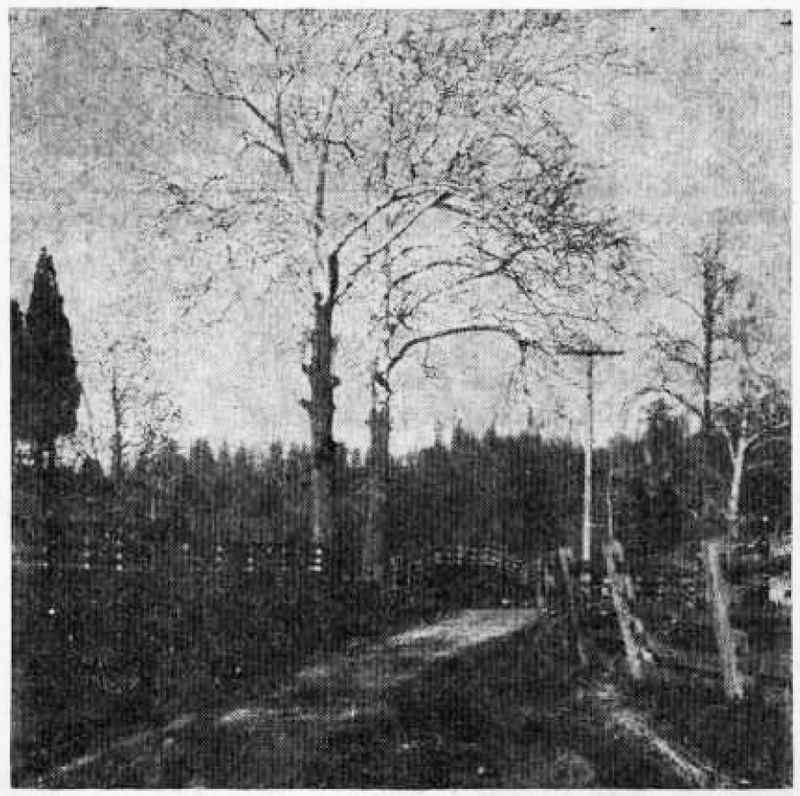 Pictured is part of Warner road in the 1890’s, as it went through the former Gardner L. Warner farm of 176 acres, before this farm was purchased by J. Howard Mecke in the early 1920’s for his Colonial Village development. Most of the beautiful homes in this section were built on the former farm land, although the houses on George Washington hill, which were constructed in 1928, are located on the former William Hughes farm. 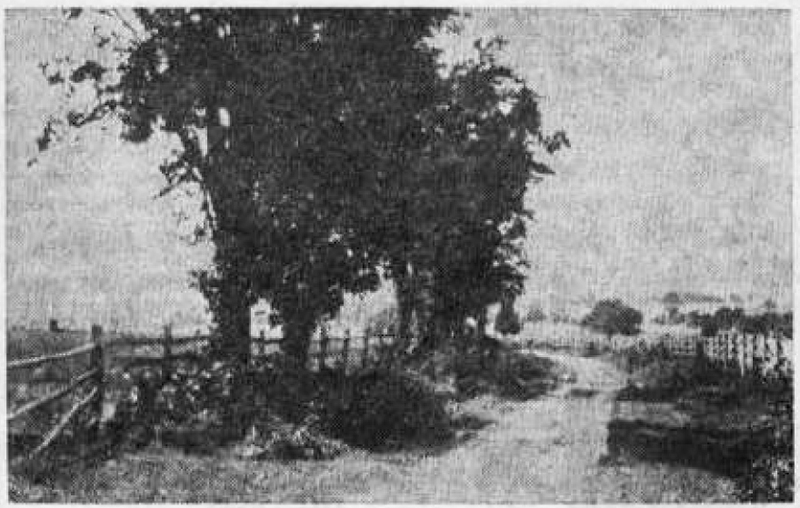 Above is Radnor road, just after it crosses Upper Gulph road, showing the two huge twin oak trees on the left. Radnor street, as it is sometimes called, was laid out in 1683, and running almost due north and south, it divides the township into two almost equal parts. Welsh Friends began to build their homes along this road as soon as it was laid out. 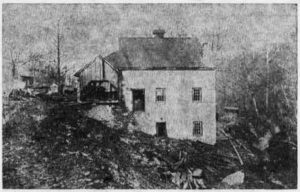 Old Hughes Saw Mill, on Croton road, on the present site of the parking lot of Colonial Village Swimming Pool. The original mill, with surrounding acreage, was bought in 1800 from Isaac Bewley and his wife, Ann Bewley, by William Carver and Abner Hughes. The latter was the founder of the large Hughes family, all of whom lived for many years in the Croton road section. In 1816 Abner Hughes built a new mill on the site of the original, and also constructed the dam which is now Colonial Village Swimming Pool. In 1855 a grist mill was built to adjoin the saw mill. Although they fell into disuse in the early 1900’s these mills were not torn down until 1922. 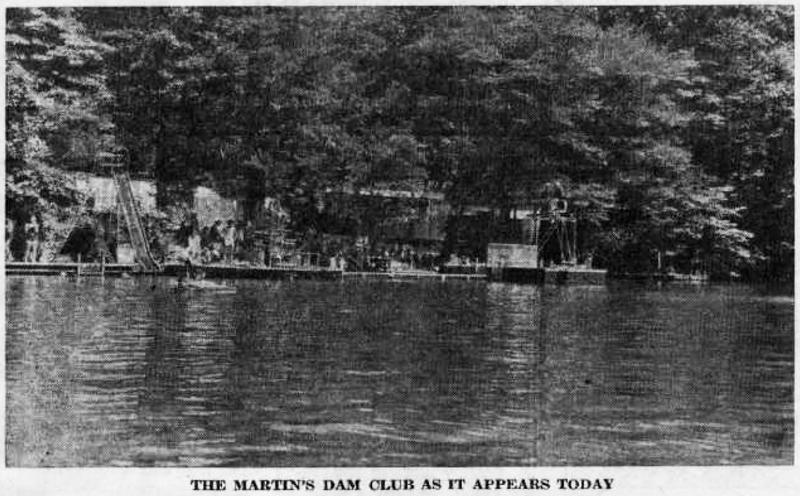 Probably the two most important milestones along the way of the Martin’s Dam Club, once it had been organized, were the actual purchase of the property in 1936 and erection of new bathhouses in 1947. For twelve years after the club was started in 1924, every effort was made by Humbert B. Powell, the club’s president and attorney, to effect the purchase of the Dam and certain acreage surrounding it. But since it was impossible to locate all the bonds which had been sold by the Lower Merion Water Company in the late 1800’s, the best that the club could do was to renew the license to operate it from the trustees of the bonds, the firm of Morgan, Lewis and Bockius, attorneys. This was done on a year-to-year basis. Finally, however, some of the bonds came into the possession of the club, and Mr. Powell acted to obtain a foreclosure of the property under the bond indenture. Following court hearings, the property was sold at auction on the Court House steps in Norristown, on March 11, 1936. 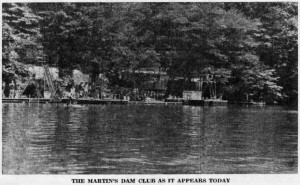 There was only one bidder against the Martin’s Dam Club and for the sum of $17,000 the club obtained clear title to the Dam itself and to 21½ acres surrounding it. The purchase was financed from the club’s treasury and by the sale of $10,000 in mortgage bonds, which were paid off in the course of a few years. It is interesting to note that this first mortgage was taken by Miss Isabel Maddison, then owner of the old Martin homestead across Croton road, which had been occupied for some years previously by George R. Park. Miss Maddison, an Englishwoman who, until her retirement, had been connected with the teaching staff of Bryn Mawr College, was much interested in seeing that the Club should continue to be properly run, since it was so close to her own property. In gratitude for her timely financial aid, the Club minutes of March 30, 1936, note that Miss Maddison was elected an honorary member of the Club, a privilege which she enjoyed until her death a few years ago. It was nine years after this, however, before the minutes of the Club meeting of October 2, 1945, held at the home of Mr. Powell in Devon, show that it was “the consensus of opinion that the Club should proceed with plans for a new bathhouse, including a water system… without committing the Club to immediate execution of the plans”. At this meeting the Planning Committee, consisting of Paul L. Lewis, N.C. Cregar and Archie D. Swift, was also authorized to employ an architect to prepare plans for the boathouse. However, it was not until two years later, in time for the opening of the 1947 season, that the handsome new bathhouses, as they now stand, were completed. The old, dilapidated buildings, which were always damp because of the heavy shade of surrounding trees and because of the constant tracking in of water, were replaced by the new bathhouses, distinguished by their open roof construction which lets in sun and air. The buildings, made of concrete blocks, painted white with contrasting stained wood trim are striking in appearance, yet entirely harmonious with their rustic setting. Entrance to a wide passageway, which separates the women’s quarters from that of the men, is from the large parking space at the back. Included in the set-up is ample office space and a room for the life guards. Theo B. White, of Villanova, was the archgitect for the building erected by Unkefer Brothers, of Philadelphia. Ralph T. Unkefer, long a resident of Wayne and now living in Ithan, is a member of this firm. Messrs. Lewis, Cregar and Swift served on the building committee. The cost of these new bathhouses was approximately $40,000. As the years since 1924 have gone by, additional acreage has been added to the Club holdings, the latest purchase being 13 acres covering the crest of the ridge above the Dam in order to protect the scenic woodland and water supply. In all, the Club holdings now approximate 40 acres. Several of these are in the parking lot and from time to time, more and more space has been given to outdoor fireplaces and picnic tables and benches, which Club members and their guests use from early morning through the twilight hours. The main dock is built where, in the early days of the Club, there was only a smooth depression in the ground from which swimmers entered the water. The dock to the left has always been known as the “Old Ladies Dock”, not so much because of the age of those who frequented it, but rather because of their reluctance to enter the water amid the splashing and shouting of the younger element. The dock to the right is known to old timers as “Stockwell’s Landing” because it was held in such high favor by one of the five founders of the Club, the late Joseph F. Stockwell. Other equipment includes diving boards, a number of floats, a long rope to swing out over the water and several life guard stands. The “Duck Pond” or “Baby Pool”, is the center of activity for the very youngest members of the Dam and the center of interest for the spectators. 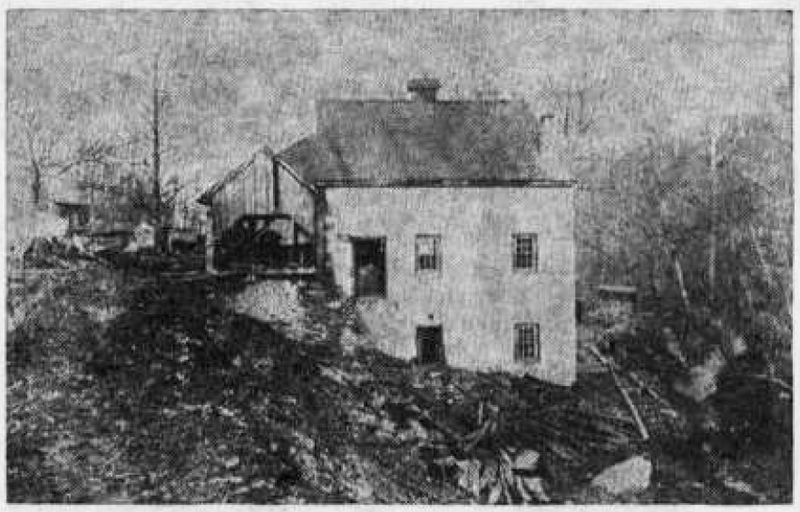 The main source of water supply for Martin’s Dam is the large spring on the Machold property, on the northeast corner of Upper Gulph and Croton roads. 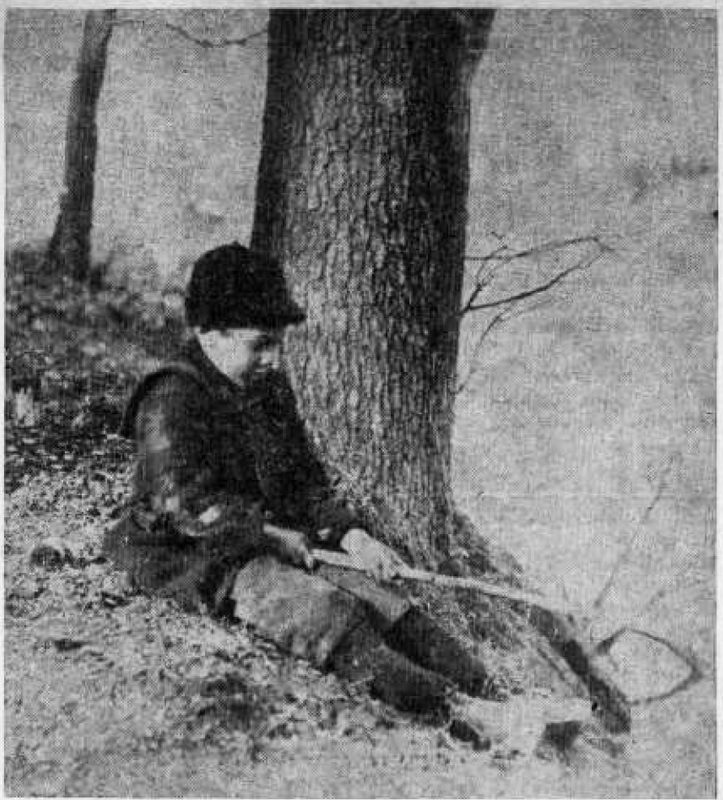 Two springs on Miss Emily Exley’s property also contribute their share. Then, too, there are springs in the Dam itself, as the extreme coldness of the water in certain parts of it indicate. All of these sources guarantee the purity of the water for swimming purposes. Management of the Club is now in the hands of a large board, made up of 15 members headed by Paul L. Lewis, of Strafford, who is also the secretary of the Club. J. Renwick Montgomery, of Wayne, serves as vice-president, while John B. Yerkes, of Villanova, is treasurer. Others include Drew M. Thorpe, Charles C. Stewart, Humbert B. Powell, Jr., Walter Y. Howson, T. Magill Patterson, Stanton C. Kelton, N.C. Cregar, and Archie D. Swift. Of the original five founding members Messrs. Lewis, Kelton and Patterson are still active, the other two, Mr. Powell and Mr. Stockton having died. Messrs. Cregar, Swift and C.H. Howson were among the very early directors. C.C. Stewart has been one of the Club’s most active members since its organization. Two of the youngest board members, Ralsten Lewis and Humbert Powell Jr., are sons of founders of the Club, while John Yerkes has succeeded his father-in-law, T.M. Patterson, as treasurer. Walter Howson is a son of Charles Howson. Officially connected with the personnel of Martin’s Dam, though not board members, are William T. Tilden, assistant to the treasurer, and Jules F. Prevost, who succeeded R.E. Hinkel several years ago as Club manager. There are now eight life guards, most of whom are of college age, in contrast to the one guard who was on duty in the early days. As the second generation of children, many of them children of those for whom the Club was founded, learn to swim at Martin’s Dam, the two men who “sat on a log and planned the Club” 28 years ago see the dream realized probably far beyond their brightest hopes. Among the youngsters they now watch their own grandchildren. In their pleasure, and that of countless others, these two men and those others who gave of their time and wisdom through the years realize the reward of their labors. The spring of 1924 was a busy one for the five men who were then organizing Martin’s Dam Club. Meetings were of almost weekly occurrence, with many at the home of the treasurer, T. Magill Patterson, on Midland avenue, others being held at the home of the president, the late Humbert B. Powell, who then lived on Windermere avenue. The first annual meeting, held in April 1925, took place in the office of the late Frederick H. Treat, on North Wayne avenue. By that time, other names had been added to the roster of board members, among them Louis S. Adams, of Radnor; Charles W. Bayliss and the late John H. Stone, of Wayne; and the late Murdock Kendrick, of Strafford. This brought the total Board membership to ten, the number at which it was held for some years. Upon Mr. Kendrick’s death, Major Clifton Lisle, of Wayne, was elected to his place. Major Lisle’s place was later taken by N.C. Cregar, of Radnor, who still takes an active part in the management of the club. Other board members of those early days of the club were Charles H. Howson, Archie D. Swift and William P. Cochran, all of Wayne. Among those names and those of the original five it is easy to recognize the heads of so many of the large families of Wayne of the middle 1920’s. The amount of the first payment due George R. Park on the lease of the Martin’s Dam property was met by an assessment made on the original five board members. Letters of invitation to join the club were soon in the mail, with membership at first restricted to residents of the Radnor-to-Strafford district. Mr. Powell, in his capacity of attorney, saw to the articles of incorporation and the by-laws of the club. Mr. Adams, an architect, designed the gate at the Croton road entrance to the property. With Mr. Kelton, he also headed the property committee, which was to make such repairs to the pump house as were necessary to convert it into a bath house. These two men were also responsible for the purchase of new equipment. The owner of a small refreshment stand which was on the Dam property was first requested to remove it, but later this order was rescinded. The small building also served every purpose, from a tool house to sleeping quarters for life guards, when it became necessary to maintain 24 hour protection of the property. By the July 9 meeting of ther newly-formed club the membership committee, consisting of the Messrs. Treat, Patterson and Lewis, reported that the lists were closed for the season, according to the limits originally set. By this time two men had been employed for full time duty, Carl Malmesbury, as a life guard, and Howard E. Adams, as caretaker. Dr. Richard P. Lienhardt was beginning his sanitary inspection, not only of Martin’s Dam itself, but of the streams which fed it – a duty which was to be his for many years thereafter. A row boat had been purchased, and orders given for an additional dock, a diving board and a float. Where there are now eight lifeguards at the club, there was but one in the first few years of its existence. Carl Malmesbury always held a unique place, both for his swimming prowess and his management of the small fry. Mr. Lewis recalls him as “a big web-footed swimmer… who obligingly gave lessons to members’ children as well as exhibitions of diving and swimming. One of his feats which particularly amused the children was being able to swim without the use of arms, simply by flapping his big feet in the manner of a duck”. Howard Adams, who acted as special policeman and night watchman, was an elderly man who was well known to all the members because of the paternal interest he always seemed to take in the club. Since it proved very difficult, at first, to keep “itinerant visitors” off the club property and out of Martin’s Dam waters, his services were valuable at all times. Mrs. Y. Parran Dawkins, one of the original members of Martin’s Dam, recalls the first swimming meet held there, the picture of which she has lent as illustration for this article. One of the small figures in the foreground on the raft is that of her daughter, Susan, now Mrs. George S. Clayton, of Strafford. Although unidentified, others in the group might well include members of the Swift, Lewis, Howson, Kelton, Bayliss and Patterson families, in addition to other children of that generation. Many, like Mrs. Clayton, are now bringing their own small fry over to the Dam. Mrs. Clayton herself was the first woman life guard ever to be employed by the club. Mrs. Dawkins was chairman of this first meet. Among those who assisted her were Carl Malmesbury. Jane Adams (daughter of Louis S. Adams) and C.C. Stewart, always one of the club’s most interested members and on the board of directors. Among the events were the quarter-mile swim, as marked off by Carl, and “the little 10-yard race”. Age limit for the latter was seven years, and contestants could get in the “Baby Pond” in any expedient fashion, even to falling in. With its first, second and third prizes this was always a favorite event with all, including the spectators. Mr. Stewart was the contributor of the “Improvement Cup”. At this first meet, Sue Dawkins headed the list and Mr. Stewart’s son came in second. Since it did not seem quite ethical for either to take it, a very astonished small boy who qualified as third received the cup. Awards were also made at this time to the boys and girls who had completed the greatest number of turns on the quarter-mile swim during the summer. When the carefully kept records were compiled, it was found that all the children’s records had been eclipsed by that of an adult member of the Club, who was always prominent in the life of Wayne, Mrs. Vera Gugert. Amid rousing cheers she was awarded one of the coveted green felt frogs used as emblems on bathing suits. In addition, all the winning youngsters received their awards. 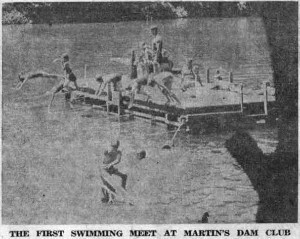 More than any other members, Mrs. Dawkins and Mr. Stewart worked to develop basic interest in good swiming among the boys and girls of Martin’s Dam in the early days of ther club.